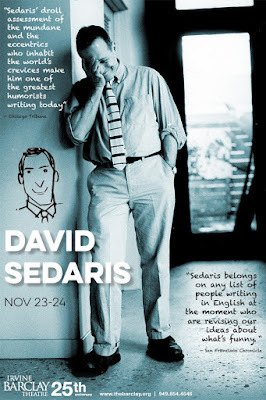 November 23 and 24, author David Sedaris will be at Irvine Barclay Theatre. Sedaris is the best-selling author of Me Talk Pretty One Day, Dress Your Family in Denim and Corduroy, When You Are Engulfed in Flames, and Squirrels Seeks Chipmunk: A Modest Bestiary and his latest book, Let's Explore Diabetes with Owls. "With sardonic wit and incisive social critiques, David Sedaris has become one of America's preeminent humor writers. The great skill with which he slices through cultural euphemisms and political correctness proves that Sedaris is a master of satire and one of the most observant writers addressing the human condition today." Show goes on at 8p.m. ; tickets are $40 - $100.